I purchased this book when I heard the author was struggling with cancer, hoping to throw him and his family a little pocket change to help pay the bills. If my review piques your interest, you might think of doing the same. 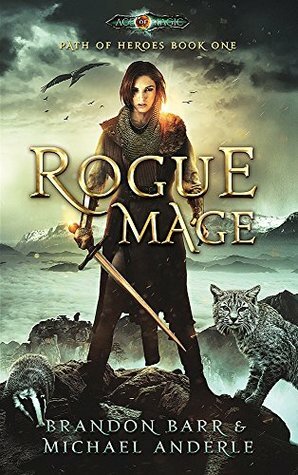 Set in a post-apocalytpic Earth, after alien technology has given people magic and people have devolved to a feudalistic lifestyle, ‘Rogue Mage’ is a light adventure in the vein of the Dragonlance: Chronicles (Dragons of Autumn Twilight et al.). This book strikes me as a YA novel, targeted to the 15-20 age group, but adults are able to enjoy it for what it is. Starring two 18 year old protagonists, this story is a traditional Sword and Sorcery tale of heroes vs villains. The author uses a ton of creatively lewd language and sexually explicit content to add a tinge of outre realism to what would otherwise be a very homely novel. The novel is a bit campy at points, but it was ‘Star Trek TOS’ campy so I enjoyed it anyway. Plot: The main characters are the last defense an innocent village has against the ravaging hordes of the mage Xerath Smith and his lackey Titannus. The mages in this novel all use mind-control magic to take control of people, bending the world around them to their will. Only the protagonist Payetta, with her nature magic and hundreds of animal companions, can save them. The tone of this book reminded me of the Dragonlance books. Pacing: The book’s pacing was probably it’s best feature. I was never bored, and there were no notable lulls in the story. Characters: The characters were fun, if a bit out there. Payetta and her husband are a pair of foul-mouthed, randy teenagers- just like a ton of people really are at their age. I’ll admit that they were a bit over-the-top at moments, but I had fun reading them by and large. I have to admit that I’ve never read any protagonists who were quite so forward as these two. Net total this book was fun, light reading. Come to this book expecting a fun romp you can turn your brain off to enjoy, and that’s exactly what you’ll get out of it.